Sahara Moon. 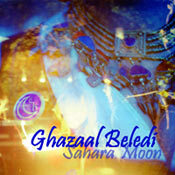 Ghazaal Beledi's first CD release is now available. Includes many favorite tunes such as "Punjabi Oy! ", "Ah Ya Zane" and "Begin Again". For a complete track listing and audio samples, please visit our Audio page.